Here are 3 Lao language posters that are sold in Laos. Shown below in their varying styles over the years. Update 2012: Here's the most recent Lao language poster for sale in Laos. 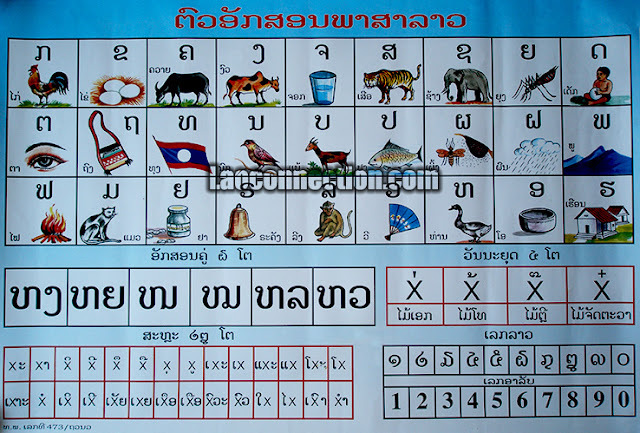 Related Post: More Lao Language Posters from 2013. By any chance, do they sell these posters in the USA or maybe there is an online store that I can order it from? A good possible source would be your local Lao community. I'd suggest asking around. Unfortunately, I don't know of any American sellers that might have it. I bought these posters while in Laos. If we come across a source/seller, we'll definitely mention it. Thank you for the posters. I doubt whether or not it is correct, "The first one is the newer one and the one below it is the old style poster.". I thought there were 27 alphabets presently, not 26 anymore, or I misunderstand? 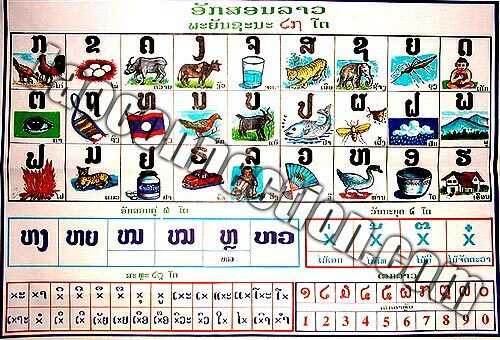 The first poster says there are 26 Lao alphabets. You're correct. In the newer poster it appears they took out one of the "L" sounding letters (ie. In the older poster it appears as the the L for loht which means car in English). Not sure why they removed it. I wouldn't be surprised if they decided to remove it to perhaps simplify things. There's still 2 characters for the letter L. Three, if they had kept that other one described above. In fact when I look at the Lao-English dictionary they no longer spell loht (car) with that character from the older poster. Instead they use the L character used to spell leeng (monkey). Either way, every now and then I still see all 3 L characters still used here and there though.